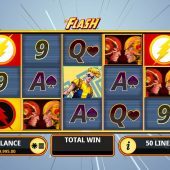 The Flash slot by Playtech a DC Comics game with fight bonus! 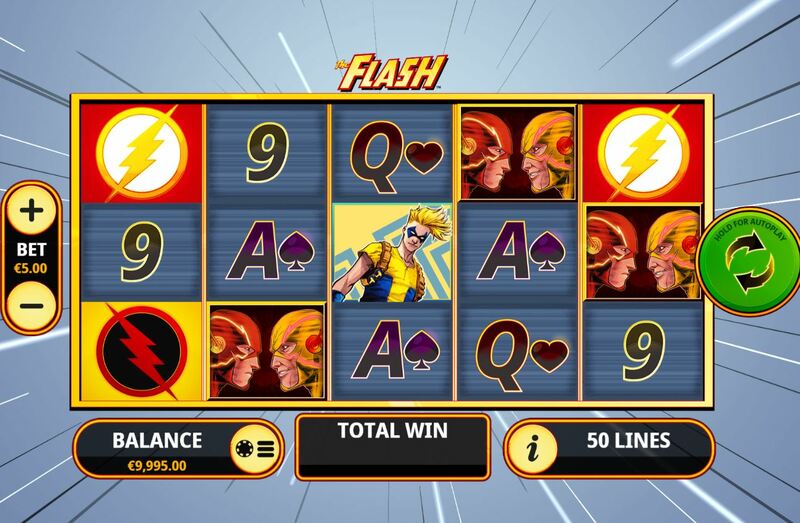 The Flash slot by Playtech is another roll out of the revamped and updated DC Comics branded slots that first appeared from Cryptologic back in the noughties. Thus far we have had Green Lantern, Wonder Woman and The Dark Knight and the older version of this was The Flash Velocity. Here we have a pretty plain appearance and very basic sounds with little in the way of audio bytes from the actual cartoons with a background of lines converging on a point behind the reels. So will it be a case of our bankroll disappearing in a flash or will we triumph over the bad guys? There are 50 fixed lines here over 5 reels of 3 rows each. Symbols are all single and we don't even get a Wild which doesn't bode well for any entertainment we are expecting to see although very rarely it may place random Wilds on the grid. The pays for 5-of-a-kinds are 40x bet for the Flash, 8x for the opposite-coloured Reverse Flash, Mixed 4x, Scatter 5x, Female 4X, Hooded Character 3x and 2x for the Masked Character. Six card values pay either 2x or 1x for a full line of 5. There are surprisingly no in-play modifiers here either - it's looking a bit grim so far! You need 5 scatters, one on each reel which are represented by The Flash and Reverse Flash characters facing each other. You will then see cash multipliers above each of the 5 reels, you choose one of the two Flash characters and they are then placed on reel 2 in the case of The Flash and reel 4 for The Reverse Flash. You get unlimited spins until all of the 5 cash values are marked off after any of the two Flash icons appears during a spin. If your chosen Flash wins by 3 to 2 or more then you get all the values. If your Flash loses and gets less than 3 then you only win the value of the values attributed to your Flash choice.